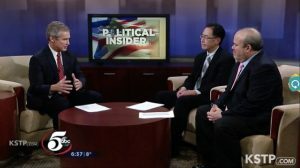 This week, Andy Aoki, department chair of political science and Sabo fellow at Augsburg College, was a featured analyst on Political Insider, a weekly news segment broadcast on KSTP. Aoki joined Larry Jacobs, a University of Minnesota faculty member, and provided input on a variety of local and national political stories including Minnesota’s health care affordability issue and confirmation hearings for President Elect Donald Trump’s cabinet members. Watch: “Political Insider: Exclusive Kaler Interview, Sessions Confirming Hearing” on the KSTP site.